I did it! I finally got rid of a store bought coffee table to make way for a quirky junk styled pallet wood coffee table I made myself. The cost? Absolutely free. It’s original, and handmade from scratch. It is the PERFECT size for our room and I couldn’t be more pleased. Here’s how I did it! Once again real woodworkers, please look away. 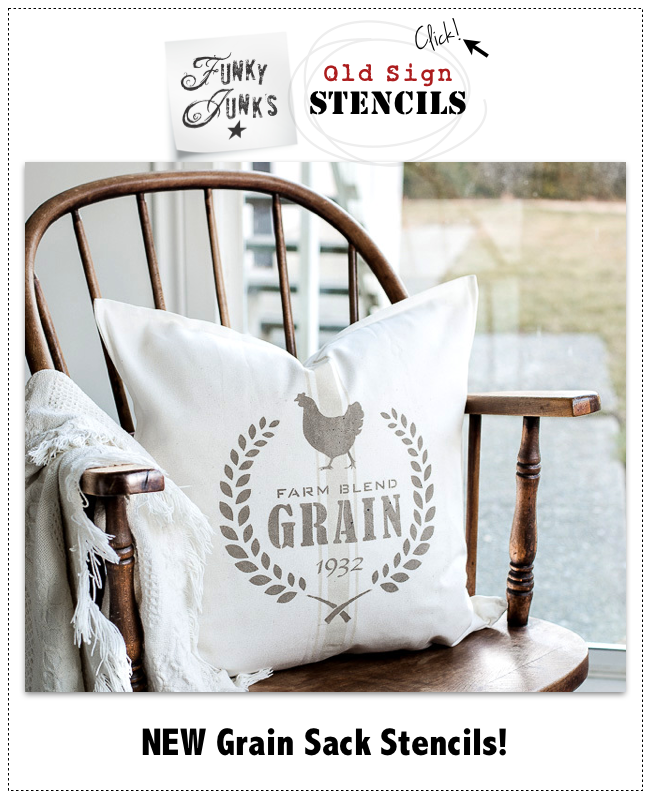 🙂 This one is RUSTIClicious! I found this pallet at a workplace and had great intentions on leaving it as a pallet. But.. I didn’t love the shape. So I ripped it apart. 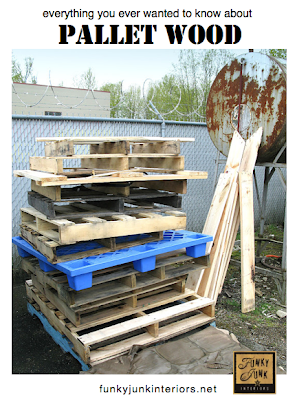 Luckily this pallet had straight nails, so it came apart with a crowbar and hammer in only a few minutes. Bonus! 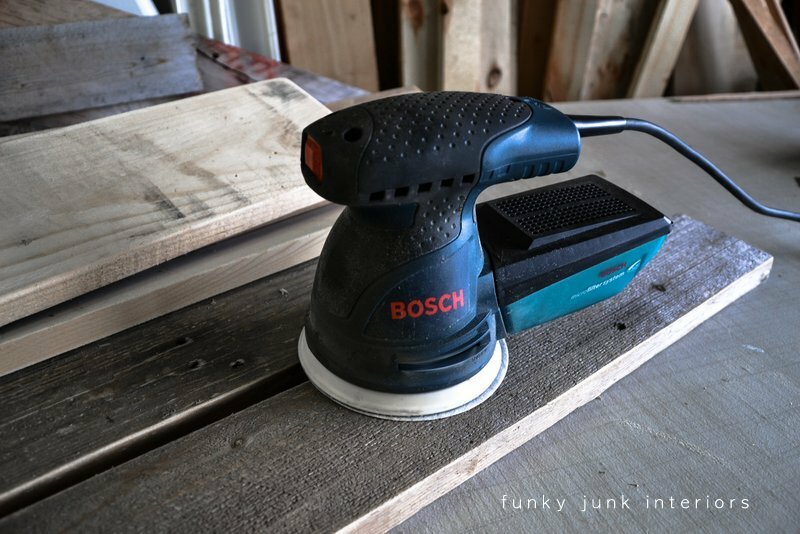 After all the nails were removed, each board got a really good sanding. Here’s how I put it together. Just imagine the boards to the left and right cut to size and slipped into place. So simple! Then all the boards got screwed together while the table sat upside down. I used a line of masking tape so I could tell where the 2x4s were located. Cool trick, huh? All the joins went together with screws, complete with predrilled holes. 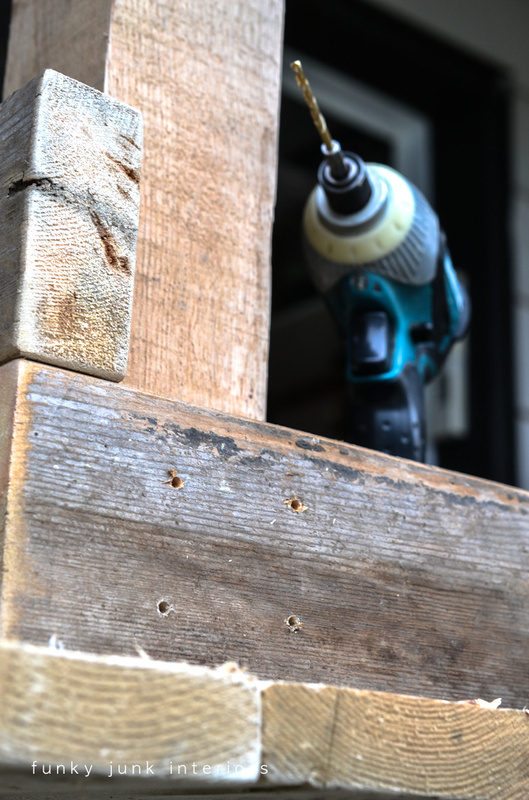 Predrilling makes installation so much easier and also reduces the chance of splitting the wood. And now the fun part! Let’s junk it up! And I even made a cute little checkerboard tray for the top! More on the tray is HERE. So fun! I love this quirky junky little coffee table and the best part of all? It was free and is so very very me. 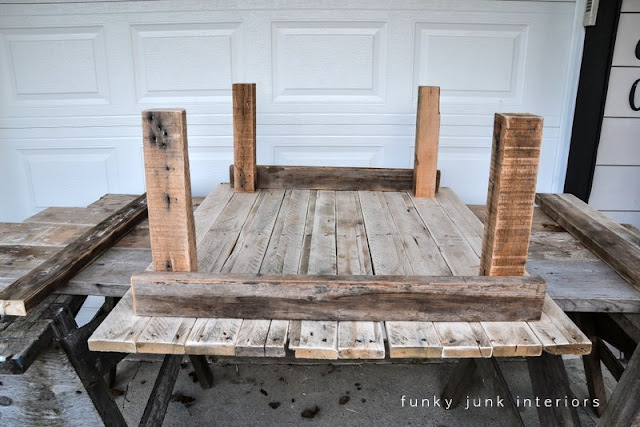 Other reclaimed lumber projects of mine and some pallet wood safety tips can be found HERE. 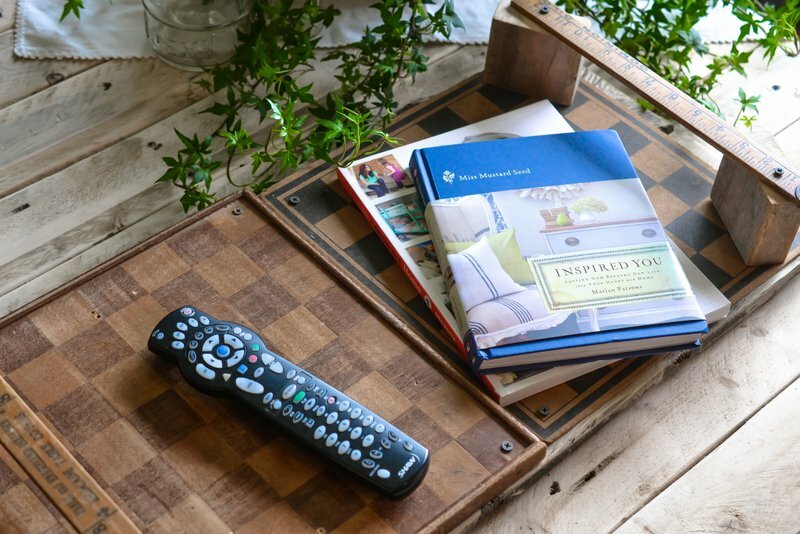 Donna – your coffee table looks great! I love it. You never cease to amaze me, this is going to my Pinterest for sure…and maybe I will even attempt one, I love how it looks! Jan from The Pink Geranium! 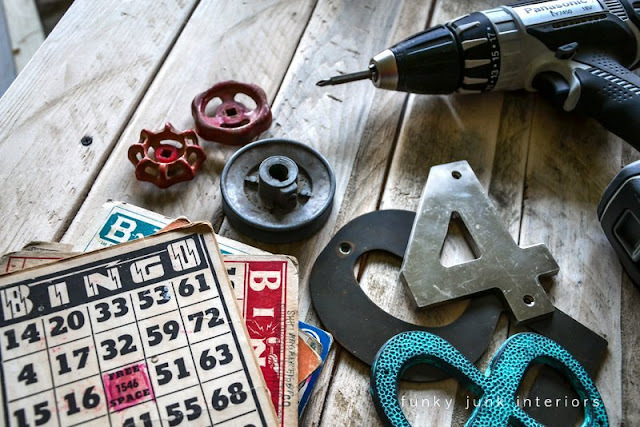 Love it Donna you are the queen of upcycling for sure! Really looks fantastic. Have a great week! Fabulous. I love it. Thanks for inspiring. I love it! Where do you(I) find pallets? I never see any around here…do I have to go look for them in a special place? I love how you added your own special touches to it. You never cease to amaze me with your talent! I live in West Texas, so heavy duty grill guards and front end replacements for pickup trucks are almost a must to have on our highways. I found some at a vehicle accessory shop that sells these grill guards and they had tons of pallets. They gave me some for free, I have got to get business and build something with these free pallets! Love it! I have some pallet’s but I haven’t done anything with them. This gives me some inspiration. Thanks! It’s cuter than ever. LOVE it!! Love it! The “junk” you added is my fave part. Adds a unique element. Looks very good to me Donna. 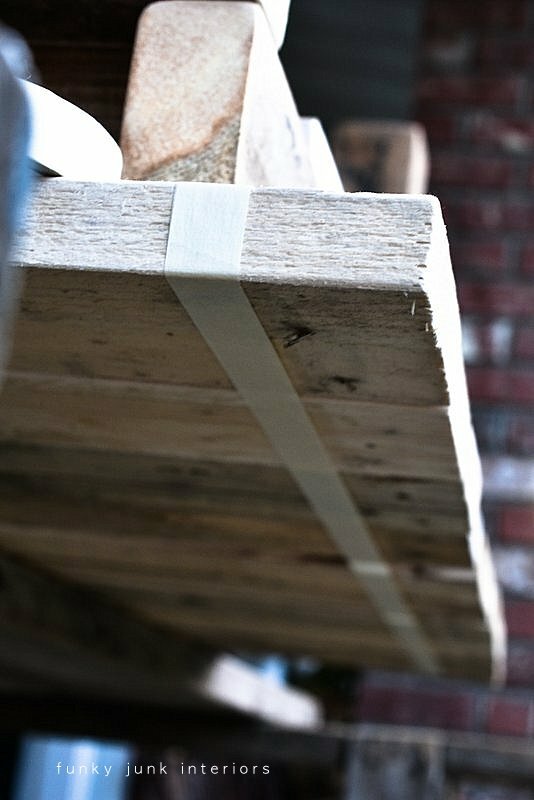 I like your idea of marking the 2×4 with the masking tape. Will use that trick next time I need it. I like the “junk treatment” on the ends too … it calls your name. You make everything so cozy, creative and fun!! Although I have never met you…I was driving down the road today and saw a pile of pallets marked ‘free’ and thought of you!! I love this table! 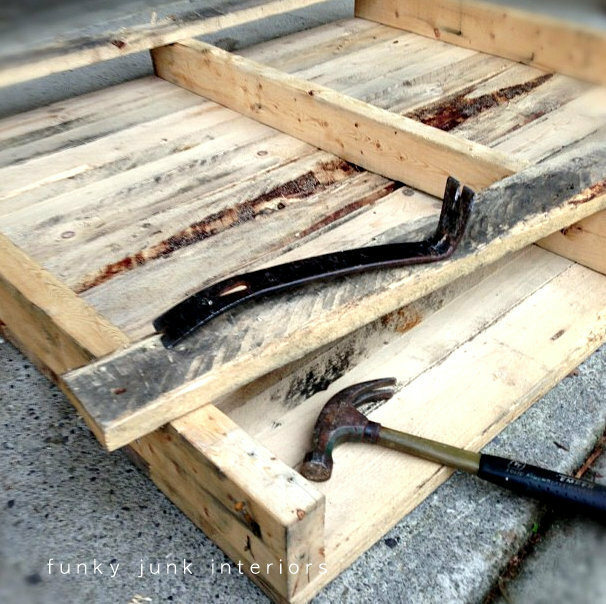 I am tryin to make a coffee table out of pallets, but every time that I try to seperate the pallet wood the wood breaks. I am using a hammer and crow bar. Any tips on how to stop this? Also try googling how to take them apart. There are loads of online tutorials and videos to gleen from. I LOVE it, Donna! And so very true that taking apart pallets is not for the faint of heart. But so very worth it! I love the coffee table. And, all the junk on the sides. Another great job. I love the sofa too. Oh My! I absolutely LOVE it… I think I already told you that on insta… maybe not, I always comment on your fab photos!! 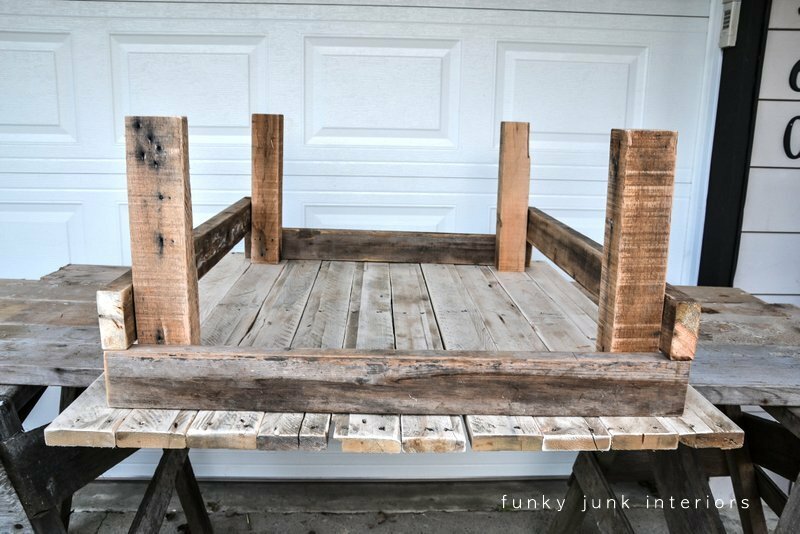 Another great pallet creation Donna. I especially like the fun junk on the bottom! Love love love this! I just built a lemonade stand out of pallets and it was so fun. Thanks for sharing and inspiring me to do another pallet project. Love your take on Pallet wood. Is is something I have yet to seen be done and I love it! Sharing it with all my FB fans today. 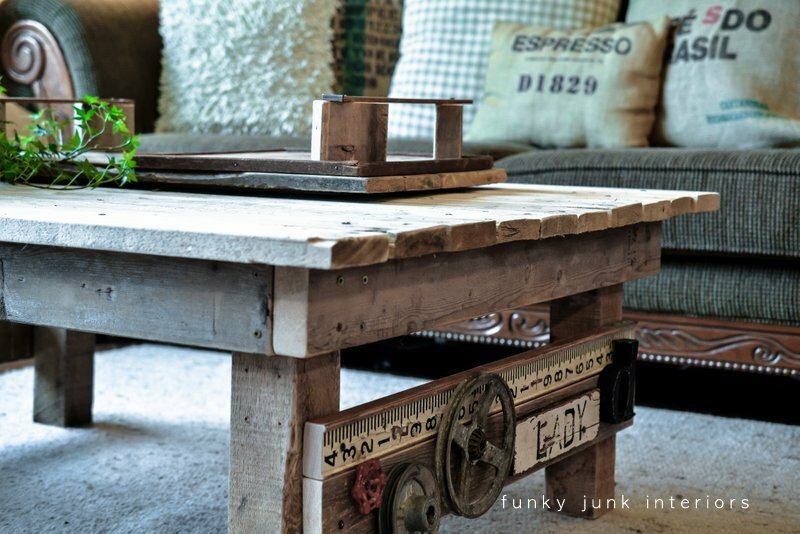 I absolutely love this coffee table! My husband hoards pallets because he works on old dozer parts, but he might find one or two missing in the spring…heh heh. 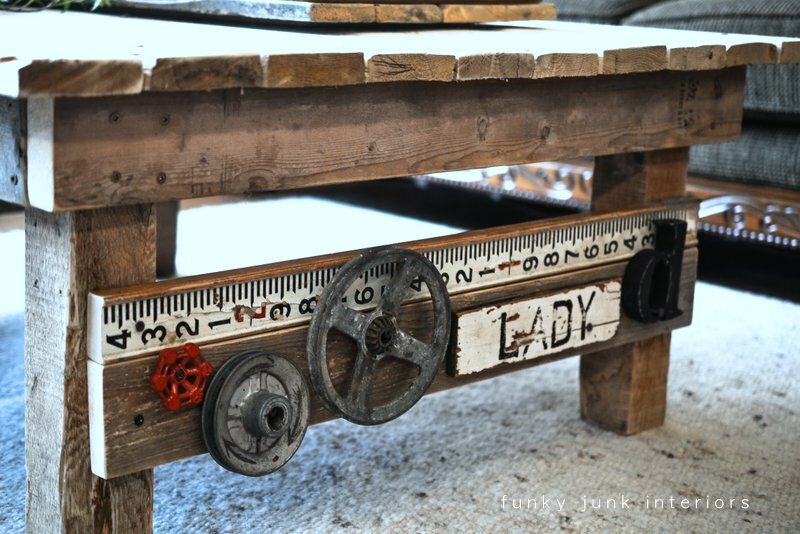 Love it, so cool and rustic looking. You have the perfect touch when adding the extras that make it so wonderful! 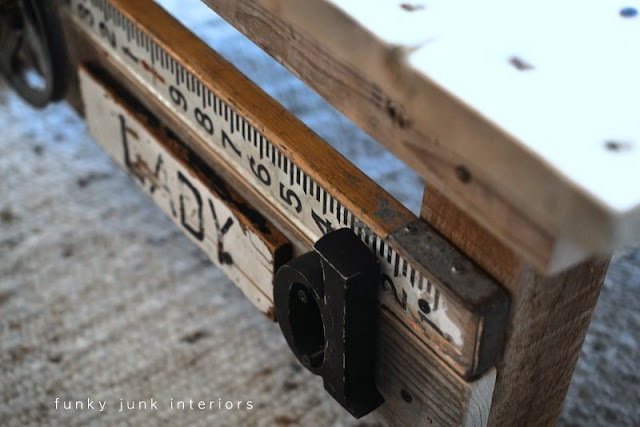 I love how you “junked” it up! Is there an adjective that goes beyond amazing? If so, that’s what I would use to describe your table. I looove this table! Very rusticlicious!!! I’m sure I spelled that wrong haha. Great job! It looks AMAZING! Not only is the table itself great, but I love how you added fun treasures on the side. 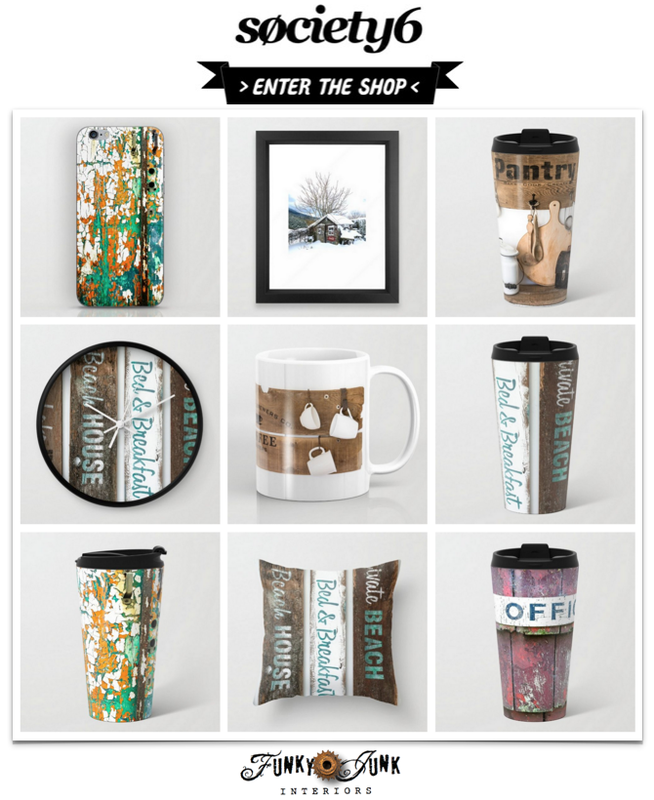 A perfect fit in your home! What a wonderful idea for a coffee table, Donna–I love it! I also really like the masking tape trick you shared–we’ll definitely be using that in the future on projects, so thank you. It is absolutely fabulous!!! I want it LOL The picture you have of the side braces (the frame under the top), did you make them even. It looks like it in the finished project. I really really love this! You are so creative and I absolutely love all your concoctions! I love it! But that baby must be heavy! Wow, back breaking to get it in the house. But so worth it. It has Donna written all over it!! Great table, Donna. Your presentation is so beautiful, your photos are so crisp and the first one/two with the outline, etc. is really so professional. Where did you get the legs? Are they 4×4 posts? Love this!!!!! she’s a beauty, and so much functional table space! Hello, I came across this from New House, New Home, New Life on FB but have a question. I didn’t read, or may have missed reading it elsewhere, if you addressed the issue of the pallet being treated with chemicals. stamped ____ or HT. HT means heat treated and are deemed more safe than the other option. This is because there aren’t any chemicals used in the process. 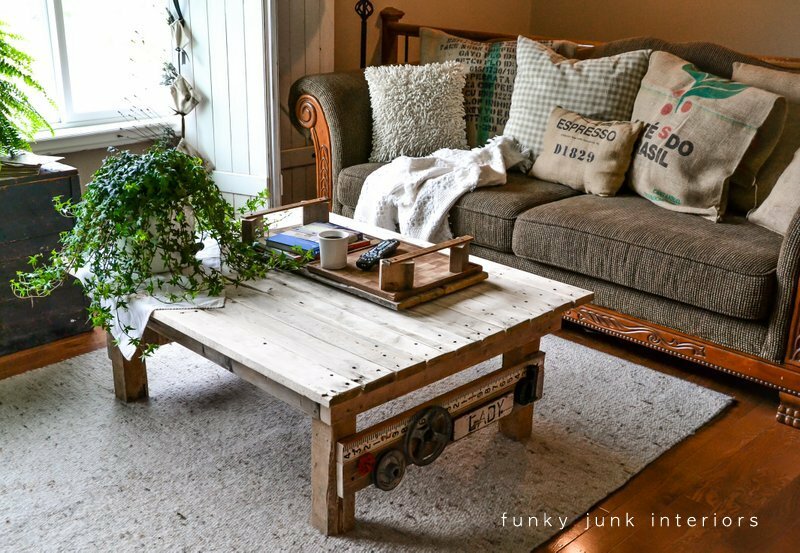 You and your projects are inspiring, and the pallet coffee table looks like something I’d love to do…any thoughts? Beautiful things, I am amazed and your hands are very handy. 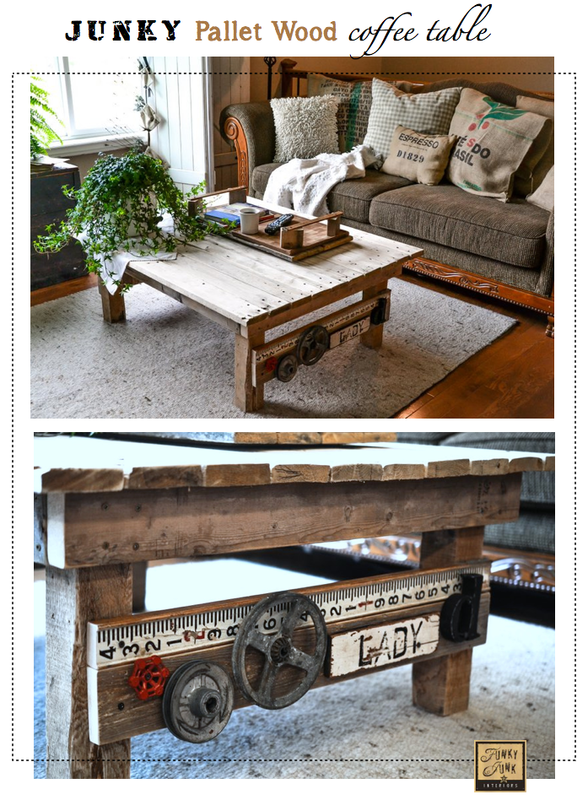 Since I love all things pallet wood made just had to pin this coffee table. Also love different and one of a kind. Your table is awesome. 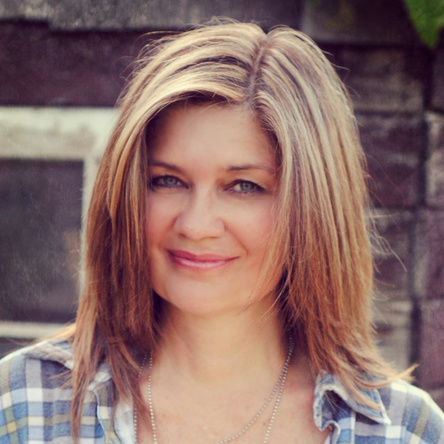 But from what I’ve heard on blog land you are one of top queens of awesome. 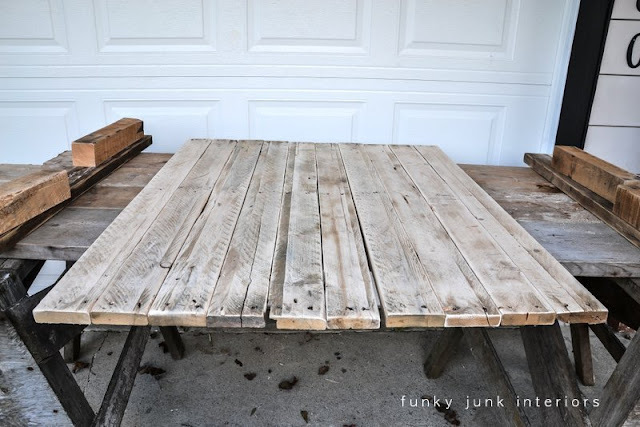 We made coffee table out of pallets for a patio or even a living room if it’s kinda rustic or industrial. 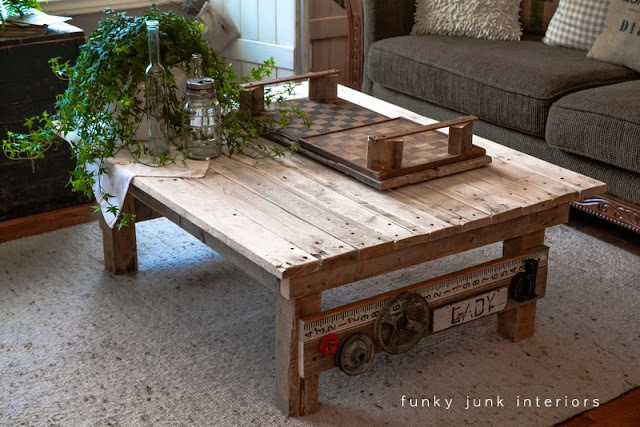 We’d use one we made but our living room is too small for it and table not really cottage style.